Born Kevin Anthony Corcoran on the 10th June 1949 in Santa Monica, California USA and was an actor, producer and a Disney legend, best known to the world as Moochie, an irrepressible character in various Disney productions. His career was active from the mid- ’50s until the late ‘00s. He passed away in 2015. Have you ever wondered how rich Kevin Corcoran was at the time of his death? According to authoritative sources, it has been estimated that Corcoran’s net worth is as high as $500,000, an amount earned through his long and distinguished career in the entertainment industry. Aside from acting, Kevin also worked as assistant director, which improved his wealth too. Kevin was the son of William “Bill” Corcoran, Sr., a police officer and later became director of maintenance at MGM Studios, and Kathleen McKenney. He had seven siblings, most of whom also became involved in acting, including Donna, Noreen and Kelly Corcoran. As early as 1954 Kevin made his acting debut, playing Steve Miller in the film “The Glenn Miller Story”, however, some of his earliest roles went uncredited. In 1956 he made his first appearance as Moochie, in the TV series “Adventures in Dairyland” as Moochie McCandless, and through the early ‘60s played several different characters named Moochie in such productions as “Further Adventures of Spin and Marty” (1956), “The New Adventures of Spin and Marty” (1957), “The Shaggy Dog” (1959), and as Moochie (Montgomery) Daniels, in“Walt Disney’s Wonderful World of Color” (1957-1963). 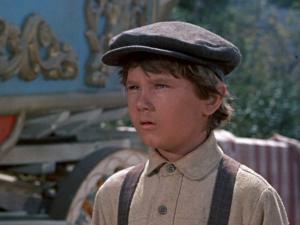 Apart from the role of Moochie, Kevin had other film and TV roles during his childhood, including as Arliss Coates in the film “Old Yeller” (1957), then as Toby Tyler in “Toby Tyler, or Ten Weeks with a Circus” (1960), and as Tom Hadley in the film “A Tiger Walks” (1964). After he finished high school, Kevin enrolled at California State University, Northridge, from which he obtained a degree in theatre arts. Following his graduation, Kevin returned to the entertainment industry, this time as an assistant director. From the mid- 80s, he worked as assistant director on such TV series as “Scarecrow and Mrs. King” (1986-1987), “Simon & Simon” (1987-1989), “Murder, She Wrote” (1991-1996), then “Profiler” (1998-1999), and “Providence” (1999-2001), all of which added a significant amount to his wealth. Regarding his personal life, Kevin was married to Laura Soltwedel from 1972 until his death in 2015. In 2009, Kevin was diagnosed with colorectal cancer, and after six years of battle with the disease, he passed away on the 6th October 2015 in Burbank, California USA. Place Of Birth Santa Monica, California, U.S.
Parents Kathleen McKenney, William Corcoran, Sr.
Siblings Noreen Corcoran, Donna Corcoran, Brian Corcoran, Kelly Corcoran, Hugh Corcoran, Kerry Corcoran, William Corcoran, Jr.
1 Kevin was cremated. His ashes were given to his family. 2 In 1957 Corcoran was given a leading role in Old Yeller, one of the best and most poignant boy-and-his-dog movies, still remembered as being a defining childhood experience for many baby boomers. Set in Texas in 1869, the film, discreetly directed by the Disney stalwart Robert Stevenson, tells of how Arliss (Corcoran) and his older brother Travis (Tommy Kirk) adopt a large yellow dog of indeterminate pedigree - "the best doggone dog in the west" as the title song declaims. At the tear-jerking climax, Travis is forced to shoot the faithful pooch, which has contracted rabies, much to the distress of Arliss. Corcoran went on to play Kirk's slightly brattish kid brother again in four further movies, in which Kirk, eight years Corcoran's senior, would portray a character going through a painful puberty, often irritated by his mischievous and talkative brother. "Don't you ever run out of questions?" Kirk asks Corcoran in "Old Yeller". In the comedy-fantasy "The Shaggy Dog" (1959), Corcoran, though younger, is wiser than Kirk who, because of an ancient curse, is turned into a large sheep dog at inopportune moments. As the youngest member of the shipwrecked Swiss Family Robinson (1960), Corcoran collects all sorts of animals, getting in the way of Kirk, who is more interested in a girl he has helped rescue from pirates. The screen brothers had a similar awkward relationship in Bon Voyage! (1962) as part of a "typical" American family on a tour of Europe. In Savage Sam (1963), a disappointing sequel to Old Yeller, Kirk and Corcoran reprised their roles, this time bickering over the defunct canine hero's son. At one stage the boys' uncle (Brian Keith) tells Kirk: "All little brothers hate bossin'. You've got to learn how to outfigger him.". 3 Kevin Corcoran was honored as a Disney Legend on October 9, 2006. Among the other recipients at the 2006 ceremony were the two lead actors in Corcoran's "Spin and Marty" serials, Tim Considine and David Stollery, and Corcoran's frequent co-star, Tommy Kirk, himself a veteran of the "Mickey Mouse Club" serials. 4 Kevin Corcoran's father, William "Bill" Corcoran, Sr. (1905-1958), was a studio-police security officer and then became the MGM Studio's Director of Maintenance at the Louis B. Mayer Culver City MGM Film Studios. Corcoran's mother, the former Kathleen McKenney (1917-1972), was a native of Quincy, Massachusetts, while husband William Corcoran and his family were native of Milford, Massachusetts. Born in Santa Monica, California, to Kathleen and Bill, Kevin Corcoran had seven siblings, all of whom did some film acting. "While my father was working at MGM, he heard that children were needed to play some extra roles," Corcoran recalled. "By the time I arrived - No 5 of eight children - the Corcoran kids had been established in the (film) industry. My folks were very down to earth," Kevin Corcoran said in 2000. "Some people's families are in the delicatessen business. My family was in the picture business." Kevin had already been in the business for a long time, having, from the age of four, had brief roles in several feature films even before he signed with Walt Disney. These included "The Glenn Miller Story" (1954) as the band leader's son; as the childhood incarnation of the lead character Paul van Riebeck (Tyrone Power) in "Untamed" (1955), and as one of Quaker farmer Ernest Borgnine's children in "Violent Saturday" (1955). Corcoran's real sisters, Noreen and Donna, played the other children. Young Kevin was fortunate to come along during a successful period of Disney's live-action movies. But Disney was fortunate too, because Corcoran embodied its vision of the "American every-kid", who the Disney studio saw as "a highly intelligent human being - characteristically sensitive, humorous, open-minded, eager to learn, (with) a strong sense of excitement, energy, and healthy curiosity about the world in which he lives." Kevin Corcoran was the sibling whose work is best remembered. Kevin Corcoran was the brother of Donna Corcoran, Noreen Corcoran, Hugh Corcoran, Brian Corcoran, Kerry Corcoran, and Kelly Corcoran (1958-2002). Another brother, Bill Corcoran Jr. (former Dean of Students at California State University, Fresno) died in 2007. Elder siblings Donna, Noreen, and Hugh Corcoran have extensive film and television film credits as child actors during the 1950s. Donna, Noreen, and Kevin all appeared in the 1955 feature film "Violent Saturday." Noreen Corcoran starred as 'Kelly Gregg' on the CBS-NBC-ABC television film series "Bachelor Father" featuring John Forsythe from 1957-1962. During its five-year run, "Bachelor Father" was seen on all three national networks. Brian Corcoran played Kevin's brother, and Kerry, his sister, in the 1960 "Daniel Boone" miniseries "Walt Disney Presents," then on ABC. Brian also was 'Willie Winkie' to Kevin Corcoran's "Boy Blue" in the 1961 feature film "Babes in Toyland." Donna Corcoran played 'Moochie's sister Marian' in "Moochie of the Little League" (1960). She also played 'Bridget White', ("...eight years old") as the little orphan who saw the "Angels in the Outfield" in the original 1951 feature film version with Paul Douglas and Janet Leigh. Younger brother Kelly Corcoran (1958-2002) portrayed 8-year-old 'Kip Pride' in the NBC western series "The Road West" (1966-1967), starring Barry Sullivan. 5 Kevin, a former child actor, as an adult became a film/television first-assistant director, producer, and a film director. He appeared as a child in numerous Walt Disney film projects between 1957 and 1963, frequently as an irrepressible character with the nickname "Moochie". Corcoran, after graduating from California State University, Northridge with a degree in theatre arts, returned to the Walt Disney - Buena Vista - Burbank film studio, this time working behind the camera as a first-assistant director and producer. His credits from this era include "Superdad" (1973), "The Island at the Top of the World" (1974) and "Pete's Dragon" (1977). Appropriately, he also worked on "The New Mickey Mouse Club" (1977). He was an associate producer on "Treasure of Matecumbe" (1976), on the sequel "Return from Witch Mountain" (1978) and on "The North Avenue Irregulars" (1979). He co-produced "Herbie Goes Bananas" (1980), and was the producer of the comedy television series "Zorro and Son" (1983). Corcoran's later contributions to Disney included commentaries and interviews on such Disney DVD releases as "The Shaggy Dog" and "Pollyanna". He also served as first-assistant director on several non-Disney television network series, including "Bay Watch," "Scarecrow and Mrs. King," "Quantum Leap," "Profiler" and "Karen Sisco"; and produced a number of projects. Over the course of his tenure on the Angela Lansbury CBS Sunday prime-time series and Movie of The Week - "Murder She Wrote" (1992-2000) - Kevin was credited as first-assistant director, assistant producer, and director. 6 David Stollery, who played 'Marty' with Kevin as 'Moochie' in the Disney short "Adventures in Dairyland," led to them being cast in "Spin and Marty." Stollery said that even at a young age, Corcoran was a professional who knew his lines and took direction. But Corcoran admitted that he didn't always have to fake being mischievous. "Tommy Kirk and I had a great relationship," Corcoran said in a 2000 Times interview. He played Kirk's younger brother in several productions, and the two often played practical jokes on each other. "I remember one sequence," Corcoran said, "in which I was supposed to be throwing rocks at him. Tommy and I had been battling off-screen about something, so instead of the prop rubber rocks, I started throwing real ones". 7 Kevin Corcoran produced the 1983 pilot episode of CBS' "Scarecrow and Mrs. King" and went on to serve as a second assistant director on that series as well as on other hour long (60 minutes) television film series like "Simon & Simon," "Baywatch," "Quantum Leap," "Murder, She Wrote" and "Providence". Corcoran was a co-producer on nine episodes of "The Shield" and on 14 installments of another FX drama, "Sons of Anarchy," created by Kurt Sutter, who said, "Corcoran was a delightful person and producer, including on "The Shield"". 8 Corcoran's acting career with Disney began at the age of six when he appeared on television in a "Mickey Mouse Club" serial short called "Adventures in Dairyland" (1956). In it he played a pugnacious little boy named 'Moochie,' a nickname that stuck to him throughout his childhood and beyond. Walt Disney was so impressed with Corcoran's debut that he had a special role written for 'Moochie' in another "Mickey Mouse Club" serial short, "Further Adventures of Spin and Marty," which was aired the same year. 9 Kevin made his movie debut in Anthony Mann's "The Glenn Miller Story" (1954), then played 'Moochie,' an irrepressible sort who hates being treated like a little kid, on a pair of "Spin and Marty" TV series and on Walt Disney's "Wonderful World of Color". Shortly after appearing in "Blue" (1968), Corcoran went in for an interview for another feature film, he recalled in a 2012 interview with the San Francisco Chronicle. "Usually they would give you pages from the script, let you know what the character is like," Kevin said. "But this director and producer said they wanted to hear about my version of the character. I said, 'Well, what is this character about?' And they fumbled around because they didn't know. Then it hit me. You know what? I know more about making movies than the guy making this picture. I'm done acting. I left that meeting and called my agent. I said, 'Thanks a lot, but no more auditions. I'm done!' ". 10 Other Disney movies in which Corcoran had leading roles were "Pollyanna" (1960), where, as Jimmy Bean, a mischievous orphan boy, he counterbalances the sweetness and light spread by the 12-year-old heroine (Hayley Mills), and "Toby Tyler" (1960), in which he played the title role, another orphan, this time running away from his foster parents to join a circus, where he makes friends with an endangered chimpanzee. However, after "A Tiger Walks" (1964), another animal movie aimed at children - a tiger is threatened with death after escaping from a circus, Corcoran, at the grand old age of 15, quit acting. "I decided to retire when I realized that I knew more about making movies than the older bunch of guys making them". 11 Kevin Corcoran began acting soon after he could walk, usually playing an irrepressible, high-pitched youngster in television shows like "The Ford Television Theater" in the early 1950s. "He was the quintessential bratty kid brother or mischievous moppet," the critic Donald Liebenson wrote about Kevin Corcoran in The Los Angeles Times in 2000. 12 Corcoran, born June 10, 1949, went on to a career behind the camera. And unlike many child actors, he had a quiet life with a long marriage and no public drama. "I enjoy entertaining people and doing good work," Corcoran told the San Francisco Chronicle. "I'm glad my life didn't have to be a spectacle." Diagnosed with colorectal cancer at the age of 60, Kevin died of the illness on a Tuesday, October 6, 2015, at Providence Saint Joseph Medical Center in Burbank, aged 66. Corcoran is survived by his wife, Laura (nee Soltwedel), whom he married in 1972, by three sisters, Che, Noreen and Kerry, and by a brother, Hugh. 13 "Moochie" - a nick-name supposedly bestowed by Walt Disney himself, became Kevin Corcoran's on set moniker - as well as the "Mickie Mouse Club" character's name, during much of Kevin's performing career. At age 7, he started appearing as 'Moochie' in 1956 on "Adventures in Dairyland," a serial short that took place on a dude ranch with fellow child actor David Stollery who played 'Marty.' David Stollery said, "Moochie - an adorable, talkative kid who was always getting into jams - was not far removed from the real-life Corcoran. He was just this little rambunctious bundle of energy," Stollery said in an interview with the L.A. Times. "He was 'Moochie', a perfect fit for the character." Other Disney child stars of the era got more notice and bigger parts. But television viewers took the pint-sized Corcoran to heart. "To kids of my generation, 'Moochie' was an irresistible figure, a kid we could all relate to," film critic Leonard Maltin said in taped comments released by Disney. "Because he was so genuine, not a goody-goody type of a model child. He had a touch of mischief and curiosity, and you couldn't help but like him." The character was so popular that Corcoran, as 'Moochie Morgan,' was featured in Disney film serials including "Moochie of Pop Warner Football" (1959) and "Moochie of the Little League" (1960), with character actor Russ Conway playing his father. Continuing his fictional 'Moochie' roles, Corcoran played Montgomery "Moochie" Daniels in the 1959 Disney film "The Shaggy Dog" (1959) . "I'll always be 'Mooch' to the guys around here," he said in a Disney studio interview. "Heck, they've practically raised me". 14 Kevin Corcoran and Tommy Kirk played brothers in five films, beginning with 1957's "Old Yeller" as the younger son Arliss Coates, with Fess Parker playing their father. The other films in this category were "The Shaggy Dog" (1959), "Swiss Family Robinson" (youngest son Francis Robinson, 1960), "Goliath II" (as Goliath II, 1960), "Pollyanna" (as Pollyanna's friend, Jimmy Bean, 1960), "Toby Tyler" (as Toby Tyler, 1960), "Babes in Toyland" (nursery rhyme character Boy Blue, 1961), "Aquamania" (as Goofy, Jr., 1961), "Bon Voyage!" (younger son Skipper Willard, 1962), "The Mooncussers" (as Jonathan Feather in a 1962 Disney TV film), "Johnny Shiloh" (as a Union Army drummer (later sergeant) Johnny Lincoln Clem, in a 1963 Disney TV film), and "Savage Sam" (sequel to "Old Yeller," playing Arliss Coates again, 1963). Fred MacMurray played Corcoran and Kirk's father in "The Shaggy Dog" and "Bon Voyage! "; Dorothy McGuire played their mother in "Old Yeller" and "Swiss Family Robinson". Corcoran largely retired from acting after "A Tiger Walks" (as Tom Hadley,1964), although he also appeared in the 1968 film "Blue" in a minor role. He was also in several non-Disney productions, including guest spots on TV series such as "Wagon Train," "The Littlest Hobo" and "My Three Sons" with one of his favorite actors, Fred MacMurray. It was probably around the time of the latter 1968 film "Blue" that he graduated from a Roman Catholic high school in Los Angeles, attended California State University, Northridge, receiving a Bachelor's Degree in theater arts. In an interview for the DVD release of "The Shaggy Dog", he credits his studio teachers with having prepared him well for his college studies. 15 Was honored as a Disney Legend on October 9, 2006. 16 He was one of eight children, all of whom acted in films during the 1950's and 60's. 17 Graduated from California State University, Northridge, with a degree in theatre arts. 18 Played Tommy Kirk's brother in five different films: Old Yeller (1957), The Shaggy Dog (1959), Swiss Family Robinson (1960), Bon Voyage! (1962) and Savage Sam (1963). Savage Sam (1963) was the sequel to Old Yeller (1957), following the adventures of the Coates brothers and Savage Sam, son of Old Yeller. 19 Brother of William Corcoran Jr., Donna Corcoran, Noreen Corcoran, Hugh Corcoran, Brian Corcoran, Kerry Corcoran, and Kelly Corcoran.